Gramopadhye joined Clemson in 1992, as an assistant professor. He was named chairman of the industrial engineering department in 2003, and assistant to the dean of the College of Engineering, Computing and Applied Sciences in 2010. In 2011, he was appointed associate vice president for workforce development. Under his leadership, the industrial engineering department increased in enrollment, research and scholarship. It embarked on several strategic educational and research initiatives in supply chain, logistics and optimization; a health systems research initiative; and additional applied research in global geographic areas, including India, China and the rest of the Asia-Pacific region. Anand Gramopadhye assumed the position of Dean of the College of Engineering, Computing and Applied Sciences on July 1, 2013. He now oversees 12 departments, with an enrollment of about 6,930 students. 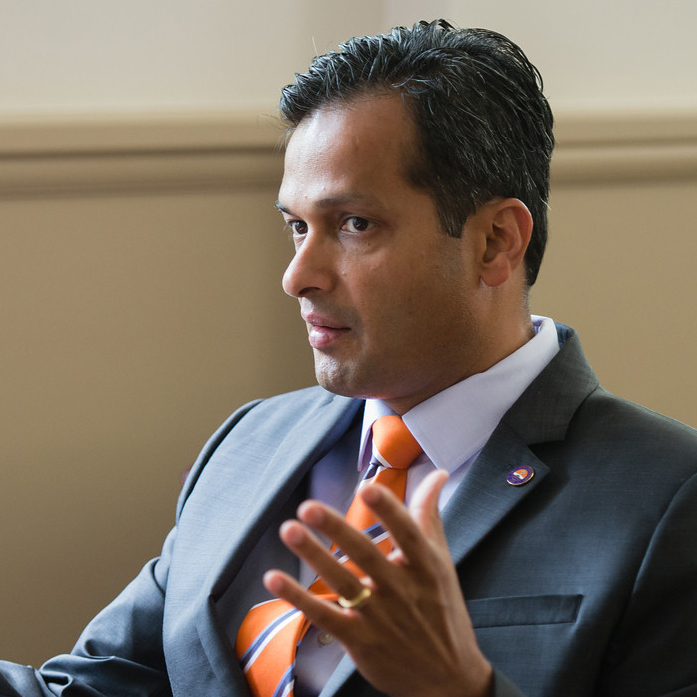 As Associate Vice President for Workforce Development, Gramopadhye helped create the Clemson University Center for Workforce Development (CUCWD). The center partners with statewide K-12 institutions, technical colleges, industry and other academic institutions and centers to address STEM – science, technology, engineering and math - issues to meet the needs of South Carolina’s 21st century knowledge economy. The CUCWD is home to the National Science Foundation Advanced Technical Education Center for Automotive and Aviation Education. Gramopadhye‘s research focuses on solving human-machine system design problems and modeling human performance in technologically complex systems, such as health care, aviation and manufacturing. He has been principal investigator for more than 75 research grants and awards, generating more than $45 million in funding. Research partners include the National Institutes of Health (NIH), National Science Foundation (NSF), Federal Aviation Administration (FAA), the U. S. Departments of Energy (DOE) and Labor (DOL), the National Aeronautics and Space Administration (NASA), and numerous corporate partners. Gramopadhye has more than 300 publications and is a Fellow of the Institute of Industrial Engineers. He was recognized twice by the National Academy of Engineering through the Frontiers in Engineering Program as one of the Top 60 engineers in the country, and is editor-in-chief of the International Journal of Industrial Ergonomics. He earned a bachelor’s degree in production engineering in 1987 from the University of Bombay, India, and a master of science in 1989 and a Ph.D. in 1992, both in industrial engineering, from the State University of New York, Buffalo. Principal Investigator on more than 75 research grants and awards generating more than $45 million in funding.